Posted by Dr. Brady Hurst in Autoimmunity. For those of you who are not familiar with Cyrex Labs, they specialize in lab testing related to gluten sensitivities and how gluten influences the intestinal tract and immune system. Cyrex Labs’ most recent test panel is the array 5. This test is a screen for what is called “predictive auto-antibodies”. These antibodies tend to be elevated years before any symptoms of autoimmunity (immune self-attack) ever develop. They also seem to be higher in those who have been previously diagnosed with an autoimmune condition. The Cyrex array 5 is extremely useful when screening for an auto-immune process in multiple areas of the body like the pancreas, joint, brain, etc. It is important to have follow-up testing completed, however, it can become costly running the array 5 for every follow-up. In response to physician feedback, Cyrex Labs has created 3 new test panels that focus on auto-antibodies to three different areas. These tests can be used as initial tests or as a follow-up to the array #5. Cyrex Labs plans to release these new test panels in September 2012. They can be ordered through TrueHealthLabs.com and AdvancedGlutenTesting.com, however, you should consult your healthcare practitioner for a full clinical work up. Sign-up to be notified the day when the Cyrex arrays 6, 7 and 8 are available to the public. Cyrex Labs has revolutionized the world of gluten intolerant testing. Their arrays 1-4 use advanced technology to find gluten intolerance, leaky gut syndrome, gluten cross-reactive foods, and the potential for autoimmune celiac disease. However, they haven’t stopped there. Cyrex Labs has now developed a new test that will screen for one of the major issues associated with gluten, autoimmunity. Autoimmunity is a process where the body’s immune system attacks normal healthy tissue. It is well-known that gluten not only can trigger autoimmunity but can fuel the “autoimmune fire”. Studies show that those many who test positive for one autoimmune condition also tests positive to others. Furthermore, it is well published in the literature (however not widely known in the clinical world) that these autoantibodies can be raised for many years, even decades before symptoms occur. Cyrex Labs has taken this information and created an autoimmune screening test panel that looks at autoantibodies to multiple areas of the body. Cyrex Labs Array #5 is extremely important for those with a known gluten sensitivity, and in my clinical experience, ANY known food sensitivity. Why? Gluten, along with other foods, can produce long-term inflammation in those with food sensitivities. This long-standing inflammation is ultimately what “confuses” the immune system and promotes the attack on healthy tissues. What we do know about the Cyrex array #5 is that it isn’t available yet. According to Cyrex’s communication with us, the array #5 will be available “soon”. You can sign up to be notified the day they release it. The main detail that we do not know is if it will be possible to order each marker separately or be required to order the entire panel. UPDATE: The panel must be ordered as a whole. Second, is the price. When we spoke to Cyrex Labs, we were told that the price has not been set. If we had to guess, we would assume it to be in the price range of $700-$900. We will update this blog as soon as we get word. UPDATE: The cost of the Cyrex array #5 is $729. If you would like to be notified when Cyrex’s array #5 will be available to purchase at True Health Labs, sign-up here for an email notification or check here to see if it is available now. UPDATE: The Cyrex’s array #5 is now available. Keep in mind that when you order lab tests through True Health Labs, you receive a free one-on-one results review. If you have a question about the Cyrex array #5 or would like to share your autoimmune story, leave a comment and make sure you subscribe. Posted by Dr. Brady Hurst in Diabetes, Heart Health / Cardiovascular Disease. The FDA is now requiring drug companies to add an additional WARNING to their cholesterol lowering statins (or HMG-CoA reductase inhibitors). New studies have shown that statins greatly increase the risk of insulin resistance and diabetes. Hemoglobin A1C, (HbA1C) is a great test. It allows us to see how blood sugar is effecting our red blood cells (therefore our entire body). High blood sugar forms a “crust” on our red bloods cells. The higher the blood sugar the more crust. The HbA1C test accurately determines how much crusting in going on. Like most drugs, statins are designed to create the illusion of health by shutting off the liver’s ability to create cholesterol. Since your body works together as a whole and not in separate parts (shh…don’t tell your doctor this), it’s not surprising that statins are causing issues in other parts of the body, in this case: the promotion of insulin resistance and diabetes. Do We Even Need Statins? In my clinical experience, the answer to this question is an a resounding NO! If your doctor is still using the outdated “total cholesterol” test, he/she is missing the boat. It is the environment surrounding the cholesterol that determines if it will stick or not. This is why more than 50% of those hospitalized for heart attack and stroke have NORMAL cholesterol levels. The best way to truly answer this question is by running a comprehensive cholesterol test with cardiogenomics. This test looks at multiple factors that influence cholesterol’s behavior and looks into the DNA to decide what TYPE of diet one should have. The results can help doctors and patients decide if statins (pharmaceutical or natural red rice yeast extract) are necessary. In almost all cases they are not, and when they are, use is only needed temporally. What Else Does Statins Mess Up? Statins act like a off-switch to your liver. Most of our cholesterol is CREATED in the liver. If you want cholesterol levels to look good on a blood test, all you need to do is…keep the liver from creating cholesterol. When our body creates anything, in this case cholesterol, it also creates one or more bi-products that our body needs to stay healthy. Since statins turn off the cholesterol creation pathway, it also shuts off the creation of those bi-products. In this case it’s CoQ10 and prenylated proteins. CoQ10 is a vitamin-like substance that keeps every cell clear of damaging energy by-products. Think of turning smoke from a power plant back in to harmless water. That’s the function of CoQ10. Statins deplete CoQ10 levels that lead to cell damage. You can check your levels with a simple CoQ10 blood test. Based on the results, your doctor can figure the right supplementation dose for you. To put is simply, prenylated proteins are proteins that are “active” and are necessary for a cell to work correctly. Since they are a by-product of cholesterol production, they are also depleted by statins. The bottom line is if you want to avoid the downward spiral of medications, you must take responsibility of your own health, and not leave it completely to our mainstream health system. Because I am committed to help you in the education process, I will personally help customers of True Health Labs understand their test results at no charge. Comment, share, and ask questions! Posted by Dr. Brady Hurst in Food, Health Articles, Healthcare. Optimal nutrition is key to slowing biological aging and preventing disease. This is exactly why you may want to ignore the Recommended Dietary Allowance or RDA. You may not know this: the majority of public health education comes from the marketing departments of Fortune 500 companies. The RDA guidelines are both right and extremely wrong. 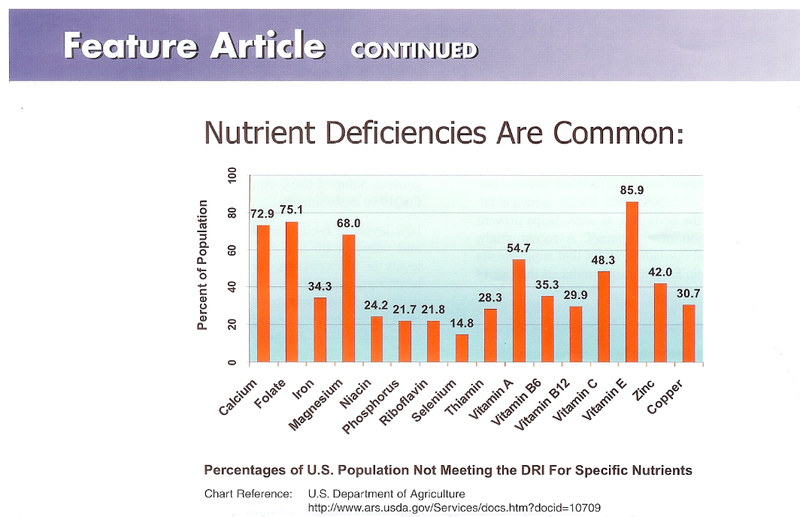 The RDA guidelines, created by the FDA, defines the RDA as “the daily intake level of a nutrient that is considered to be sufficient to meet the requirements of 97–98% of healthy individuals.” This is correct, however, the language here is extremely misleading because it uses “to meet the requirements” to cover up it’s true meaning. What the RDA really means is the minimal daily intake level of a nutrient to relieve deficiency symptoms of that nutrient. The RDA has NOTHING to do with optimal health. This is why you see 100% RDA on vitamin packaging at Walmart or GNC, two large companies that sells nutritional supplements but knows nothing about health. If you look at supplements the professionals offer, you will see that the amount of nutrients are hundreds even thousands of times the RDA. This is because the professionals who highly educated in nutrition know that specific amounts of nutrients are needed to achieve OPTIMAL health for individuals. Ask Yourself: How do I Know How Much Nutrients to Take? The answer to this questions is…it depends. Everyone has very different nutritional needs and different amounts are needed to reach optimal levels. The easiest and most effective way is to run a NutrEval test. This test gives a very detailed analysis (and recommendations) on everything from vitamins and minerals to proteins and Omega 3 needs. Remember, optimal nutritional needs are very different from the minimal RDA. A one-a-day pill does not cut it for most people. Optimal nutrition is key to slowing biological aging and truly preventing disease. Have you taken this test, made specific changes and seen improvements in your health? Leave a comment and tell us about it. Posted by Dr. Brady Hurst in Heart Health / Cardiovascular Disease. In the past few decades, standard health care had used basic cholesterol testing as the cornerstone for the treatment of heart disease. However, more than 50 percent of those with “normal” values end up hospitalized due to a stroke or heart attack1 . We now know cholesterol isn’t the sole problem. What must be considered are genetic factors that influence the behavior of cholesterol. Today we have a advanced heart disease prevention test that tells us our true risk of heart disease. Many studies conclude that cholesterol size and density plays a greater role in the prediction of heart disease than the total amount of cholesterol. Think of it like this: You have 10 people who want to take a trip. They can either take 1 bus (less traffic) or each take a car. 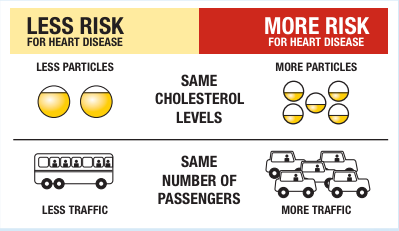 Not only do the cars create more traffic, they can also easily stop on the side of the road (cholesterol sticking to the side of an artery). What’s the size of your cholesterol? A low long-chain saturated fat and low cholesterol diet has only a moderate lipid-lowering effect in APOE3 individuals. Bio-idential hormone replacement therapy generally improves the lipid profiles, including post-menopausal APOE3 women. Tendency toward higher triglycerides and LDL-cholesterol and lower HDL-count. Reduce excess weight. Start with a 10 pound goal. A low long-chain saturated fat and low cholesterol diet most effectively lowers LDL-C in APOE4 individuals. Minimize alcohol (may raise LDL-C in men and cause damage to the hippocampus (memory center) when homocyctine is high. Provided by our lab, True Health Labs, the new Heart Disease Prevention Test with Genomics can play a critical part when preventing heart disease. If ordered online, one of True Health Labs’s doctors will review the test results with you for free. Posted by Dr. Brady Hurst in Health Conditions. Could a Simple Lyme Disease Test Uncover Mystery Illnesses? Lyme disease is one of the most overlooked conditions in the US. Why? The main reason is that early Lyme disease symptoms are extremely similar to that of the common cold. This makes it very easy for doctors who are not very well versed in Lyme disease to miss it or disregard it as a cold. Untreated Lyme disease (pharmaceutically or naturally) can continue to promote dysfunctions and chronic illness. In many cases, the only way for patients to get tested is to order a Lyme disease test themselves. I’ll show you how to do this. Lyme disease is caused by the bacteria borrelia burgdorferi. Borrelia is transmitted to us mainly by ticks, however, it is important to know that ticks in their nymphal stage (new born) is most likely to transmit the bacteria. They’re really small so there may not be any evidence of a tick or a tick bite. A bull’s-eye looking rash surrounding the bit site. This is common but may not be bull’s-eye looking at all or even absent (the reason why it’s rarely tested for); The incubation period (time between bite and symptoms) can be 3-30 days so one may not attribute the rash to a tick bite at all. Common cold symptoms: fever, fatigue, muscle soreness etc. Lyme disease tests are seldom run because in many cases, the sings of the acute infection are gone by the time the doctor examines the patient. The patient may then be forced to do his/her own research and order Lyme disease tests themselves. If this is you, here’s how you order Lyme disease blood tests yourself without it ever getting reported to the insurance companies. When we get exposed to foreign bacteria, our bodies produce a form of white blood cells called antibodies. These antibodies help the immune system not only effectively attack foreign bacteria but also helps it to be ready for future exposures. The Lyme disease test can give insight to whether or not you have been exposed to the borrelia bacteria. To minimize false negative/positives, the Lyme disease western blot test can be ordered to help confirm the presence of high borrelia bacteria antibodies. Natural killer cells (nk cells or CD57 cells) are white blood cells that help our bodies fight infections. Lyme disease seems to decrease the number of natural killer cells, thus keeping the Lyme diseases active . The CD57 test is extremely important because it helps monitor improvements of the natural killer cells as treatment progresses. What Do I Do If I have Chronic Lyme Disease? Finding the right doctor, one that is versed in Lyme disease, is extremely important. Whether if you are seeking pharmaceutical or natural treatment options, it is possible to greatly improve your health and possibly recover from Lyme disease. You can find a doctor here. Tell us your story. Did our standard healthcare system help you or a loved one with Lyme diseases? Posted by Dr. Brady Hurst in thyroid. Thyroid problems such as hypothyroidism, Graves’ disease, and Hashimoto’s are reaching pandemic levels in the USA. Many studies show that environmental exposure to certain chemicals triggers and promotes thyroid disease 1. In this article we are going to discuss 3 of the biggest chemicals that promote these thyroid problems. They are Bisphenol A (BPA), Triclosan, and Nonylphenol. BPA is a chemical found in many of the plastic products we use including water bottles (recycling numbers 3 and 7), plastic containers, and thermal paper receipts. BPA coats the inside of these containers and are leached out where it is then consumed or absorbed through our skin. Heat, like leaving your water bottle in your hot car, and microwaves can dramatically increase the leaching rate. Studies show that BPA disrupts thyroid function by not allowing the active thyroid hormone, T3, to reach the DNA 1. This may be, in part, the explanation why so many people continue to have thyroid symptoms even when lab tests are normal. Due to our current model of standard healthcare, most doctor are never taught to administer BPA testing. As patients become better educated on the other factors that promote their thyroid problems, they will run tests, like BPA, themselves. Triclosan is found in personal care products like toothpaste, shaving cream, and hand soaps. It effects on thyroid function is very similar to the way BPA where the ability for the active thyroid hormone, T3, to influence DNA is shut down 2. Nonylophenol, found in dry cleaning chemicals, pesticides, paper manufacturing, paints/coatings, household cleaners, as well as PVC food packaging mimics estrogen in the body. Theses xenoestrogens are well known to promote thyroid problems as well as infertility 3. If we are all exposed to these chemicals to some extent the why doesn’t everyone have thyroid or other health problems? The answer is- You can run but you can hide. We will get exposed, however, the body is extremely resilient. We have the ability to breakdown and get rid of these harmful chemicals, but not if we get overwhelmed or don’t have the nutrition necessary to get ride of BPA, Triclosan and Nonylophenol. Nutrition? Yes. The P450 enzyme in the liver that detoxifies these chemicals is DEPENDENT on our nutritional status. Yes, food DOES matter. The only way to know if these chemical are playing apart in your thyroid problems is to run a BPH / Triclosan / Nonylophenol urine test. If these chemicals are in fact building up in your body, aggressive steps can be made to avoid and detoxify these chemicals giving your thyroid a fighting chance to recover. Thyroid testing should always be considered along with chemical toxicity testing. Feel free to leave a comment and tell us your story. 3 Endocrinology. 2009 Jun;150(6):2964-73. Epub 2009 Feb 19. Posted by Dr. Brady Hurst in Uncategorized. I wanted to remind you that I now have Facebook group page where you can come and ask me your health questions, share your health tips with others, and meet people who have the same health concerns. Just click the FB join button. It FREE! Posted by Dr. Brady Hurst in Autoimmunity, Food. Have health questions for Dr. Brady? Ask him directly on our Facebook group page. New Gluten Intolerence Tests from Cyrex Labs Give Deeper Insight into Gluten Intolerance. Gluten is a protein found in wheat, rye, and barley. Gluten gives bread its fluffiness and chewiness. Research has shown gluten to be connected to manydiseases such as celiac and several autoimmune diseases including a thyroid condition known as Hashimoto’s. Until recently, testing for gluten intolerance has been extremely limited. Cyrex Labs has developed new groundbreaking technology in gluten intolerance testing and has the ability to accurately determine whether gluten is damaging your health. The public can now order Cyrex tests online. This saliva test is the best way to detect gluten sensitivities early. Standard blood testing for gluten intolerance typically tests positive only after their has been extensive damage to the gut or other tissues. Since autoimmune conditions such as celiac disease and Hashimoto’s have gluten and genetic components, this test would be of use for those with a family history of autoimmune disease. Taking a saliva sample is also easy to collect in the case of children who are suspected of being gluten intolerant. Learn more about Cyrex Lab’s Gluten Intolerance Test. The gut of those who are gluten intolerant can be damaged by gluten intake. This damage can lead to what many call “leaky gut syndrome”. This means that things like large food proteins and bacteria that are meant to stay within the lumen of the gut now enters into the blood. The body’s immune then reacts to naturalize the “foreign invaders”. This reaction creates inflammation, which if allowed to continue, can damage organs and lead to other chronic diseases. Testing for intestinal permeability is important in the recovery from long-term gluten exposure. Learn more about Cyrex Lab’s leaky gut test. Research has shown that components other than alpha gliadin can cause damage. As mentioned earlier, standard testing for gluten intolerance only tests for antibodies to one component of gluten, alpha gliadin. This test looks at the 12 most common reactive components of gluten. This is important because not all who are gluten intolerant test positive for alpha gliadin. Since gluten intolerance is highly associated with celiac disease, markers for autoimmune celiac is included with this test. This test is also referred as “Array 3- Wheat/Gluten Proteome Reactivity & Autoimmunity Profile”. Learn more about Cyrex Lab’s 12 component gluten intolerance test. Gluten has received the majority of the attention because it is the the most researched. It is extremely important to understand that other foods (even gluten-free foods) can react in the same manner as gluten. Many foods can cross-react like this, however, this test looks at the 24 most common foods that cross-react with gluten. Some common cross-reactive foods are corn, rice, coffee, and chocolate. This test can help doctors and patients develop a clear and effective lifestyle plan. Learn more about Cyrex Lab’s gluten cross-reactive foods test. When understanding autoimmune conditions such as celiac disease or Hashimoto’s, one must realize that it all starts with an underlying immune dysfunction. Th1/Th2 cytokine testing and CD4/CD8 ratio testing are powerful tools when understanding the root immune dysfunction. You and your doctor can use the results from these tests along with the Cyrex Lab tests to develop a course of action to improve the underlying immune dysfunction and create a better quality of life. Looking to purchase Cyrex Lab tests or other lab tests? Take our very short survey for a 5% discount. Posted by Dr. Brady Hurst in Healthcare, Uncategorized. Most of us have health concerns. Whether you have questions about disease prevention or healthier options for current health issues, getting useful information can be difficult. Why? It’s because most doctors do not TAKE the time to educate you. We have a current healthcare model that geared towards symptom suppression and not health promotion. Therefore, we have millions of people who fall into this pill-popping model even if they don’t want to. your specific health concerns in focus. Our new program, “The Doctor’s In LIVE” is a place for you to come ask me your pressing health questions live via video chat. Since our model is a Functional Medicine model and not a pharmaceutical/symptom suppression approach, my clinical opinions will be geared towards helping you dig deeper into the cause of your health concerns. The Doctor’s In LIVE is free for everyone so make sure you send the sign up form to your friends and family. The date and time of the next Q&A will be sent out via email only (sign up now). Make sure you mark it in your calendar. Go to “Ask Doctor Brady LIVE“. When Dr. Brady’s status becomes “live”, click the “chat” button within the video window. Type in your first name (press enter) then yourquestion (press enter). He will answer questions on a first come, first served basis. If you still have questions and would like to speak with Dr. Brady, you may schedule a FREE 5 minute consultation with him. Return to “Ask Doctor Brady LIVE” page on your own time. Click “More” within the video box and review the Q&A session you missed. Again, the goal of the Q&A session is to help you better understand the root causes of your health concerns and give you tips on how to address them. “The Doctor’s In LIVE” has already been a huge success with over 800 attendees in just a few short months. Bring you family, friends, and your questions to our next session. I hope to see you there. Get Dr. Brady's health tips and discounts off laboratory tests. Have a health condition you are concerned about? Dr. Brady may be able to help. Set up a 5 minute phone call with him now.